Do you love a light and refreshing meal - salad? If so, one of the biggest problems you may be facing while trying to prepare a salad is the time it takes to wash, clean, dry and prepare the ingredients. However, this is when salad spinners can make life easier. But, when it comes to picking up one, you have a wide range of options to choose from. For instance, you can pick the BPA free salad spinner, stainless steel salad spinner, collapsible salad spinner and more! Not all salad spinners are the same. So how to pick up the best salad spinner that suit you? Which one will fit your kitchen? Which one is easier to use? This quick guide will show you how to choose the best salad spinner based on your requirements. Read on to know more on how to pick a salad spinner and also to read reviews about some of the best-rated and good customer-satisfaction rating salad spinners that you can buy below. Btw, if you are a fan of pineapple like me, I like to mix pineapple slices into my salad. The taste can be refreshing and delicious. Check out how you can make perfect pineapple rings to accompany with your salad by using one of the be﻿﻿s﻿﻿t pineap﻿ple core﻿﻿r﻿s featured in the post. It is a small kitchen appliance which helps in washing and drying out vegetables for your salad. After rinsing the vegetables, spin them in the spinner to remove out a majority of water. This results in crisp and delicious leafy greens. The reason veggies are crisp because the salad spinner spins out the additional water after washing and leaves the vegetables dry rather than let them soak wet. The spinner bowl is also large which makes it easy to store it in the refrigerator for later use. A salad spinner is incredibly easy to use and also can be used for a number of other things apart from drying veggies. The salad spinners can be used to dry fresh herbs, get out water from cooked beans, remove excess water from pasta and do a lot more. So long you can fit them into the spinner, you are good to go. If you are new to a salad spinner and would like to give it a try, buying one can be a daunting task. There are a number of brands out there to choose from that making the decision can be a little overwhelming. Therefore, the first step is to know more about different kinds of spinners and pick one up that suit your regular use. These are the models where you simply pull a cord to make the spinner work. These are the cheapest category of salad spinners; however, there have been complaints from the users that the cords break easily. These types of spinners had a crank but made it like a pump present on the top of the lid which is pressed to make it spin. Whenever you apply more force to the pump, the spinner will gain momentum and speed of spinning will increase which will spin out the majority of the water from the leafy greens. Turn a crank and the gears inside will move the spinner. Much like a washing machine, when the spinner gets momentum, the spin speed will increase, and water will be spun out from the leafy greens and leave you with crisp vegetables. One of the most expensive categories of spinner yet the easiest to use, the battery operated spinners. All a person has to do is to press a button and turn on the spinner. Switch off the spinner when it’s done. If you are planning to buy in a new spinner, make sure to find a model that is in sync with the below-written checklist. You should pick up a spinner that will meet your requirement. To determine the right size, you should know that 2 quarts can cater for two people and 3 quarts is enough for four to six salad servings. You can also pick up a 4 to 5 quarts capacity tool that is good for six to eight servings. If necessary, choose a unit that comes with a tight-fitting lid. The fitting lid will ensure proper arrangement and stacking of the cover mechanism when storing in the fridge if you are planning to own a few of the same model of salad spinners. The spinner uses centrifugal force to generate a lot of speed, and this speed can sometimes result in flying off the vegetables if the lid if not secure enough. Therefore, look for a tool that has secure snap locks for better security. There are different type of salad spinner. For instance, there is pump spinner, spinner with cord, electric salad spinner, or battery spinner for ease of use. Choose one that is suitable for your regular use. A plastic salad spinner may contain harmful toxins, so it is always better to get your hands on BPA free salad spinner. Plastic made of bpa free is safe for food grade. Another important aspect to look into while buying one of the best salad spinners is to check whether or not it is dishwasher safe. Many companies claim that their product is dishwasher-safe on the top rack, but it is not true. In some models of salad spinner the outer bowl doubles as a serving bowl. Like the OXO salad spinner, it comes with a outer glass bowl that can be use as a serving bowl too. Here are our top 3 picks of salad spinner and they also got great reviews from the previous buyers. If you are shopping around for salad spinner, these bpa free salad spinners is an excellent choice. This OXO spinner is a BPA-free salad spinner. It’s also one of the best-selling salad spinners on shopping website like the Amazon. The OXO salad spinner is made of food-safe, BPA-free plastic; this 5-quart unit can easily be used with one hand. It comes with non-slip knob and non-slip ring at the bottom that keeps the bowl steady while you are spinning and drying the content inside the spinner. America's Test Kitchen recommended this salad spinner too. The Prepworks is a small sized salad dryer which is ideal for preparing two side salads. It comes with a long handle for easier control. It is suitable for left-handed as well as right-handed users. The Culina space saving salad spinner comes in three different parts – the clear bowl, tightly fitted lid and slotted colander. It also features an instant stop brake button. The handle is made with material to prevent slip and comfortable when holding it. This tool is perfect for rinsing and drying vegetables along with serving and storing them in the fridge. The lid should be hand washed, while the other parts are dishwasher safe. There you have it. We hope that this post has shown you some useful information about a salad spinner. 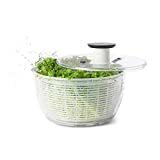 Also, if we were to choose one among the 3 featured BPA free salad spinners above, I would go with either the Prepworks or Culina salad spinner. Both of the salad spinners are some of the best salad spinners that score a high grade of net customer satisfaction as well as highly rated by previous buyers for its quality as well as efficient of the product.